The bus lowers an accessible ramp, allowing several passengers who use wheelchairs to board early. Nearby a group of Chinese youth snap a group photo. Several moms work on corralling energetic toddlers and packing up strollers while another breastfeeds. People finish stashing backpacks, bottled water, and picket signs adorned with bright yellow butterflies into the baggage compartment under the bus and find a seat. While organizers make sure everyone has signed a waiver, the riders settle in, chatting in a mix of English and Spanish. Kono is the Network Director for Hand in Hand—a national network of employers of nannies, house cleaners and personal attendants that has been mobilizing its members to fight Trump’s policy of family separation. She was one of several organizers of a caravan from the San Francisco Bay Area to the border to participate in the July 2 #FreeOurFuture action called by the imigrant justice group Mijente. As part of the actions, thousands of people from across the country converged on San Diego, briefly shutting down the Federal Building and Federal Courthouse to call for not just an end to family separation, but to end detentions and abolish ICE itself. Under his “zero-tolerance” policy, Trump has separated nearly 3,000 migrant children from their parents, sparking widespread outrage. Among those joining the protests have been immigrant rights activists, youth, faith leaders and civil rights advocates. By engaging and turning out members, Hand in Hand is now bringing an additional constituency to the fight in impressive numbers: the employers of immigrant workers. “As employers of domestic workers, every day we uplift the value of care work. It makes sense why our members would mobilize against a policy that stands between parents and their ability to care for their children,” explains Kono. One of those members is Monique Harris. Together with her son Brandon and her personal attendant Jules, Harris braved the 16-hour round trip and blazing San Diego sun to be at the march. As someone with Cerebral Palsy, she has employed domestic workers to support her with her daily needs since she was 15 years old. Wearing her Hand in Hand t-shirt and with a hand-written “Families Belong Together” sign affixed to her wheelchair, Harris explained why felt compelled to stand in solidarity with immigrant workers. As an organization with many members who have disabilities, Hand in Hand is making important connections between immigrant liberation and disability justice. 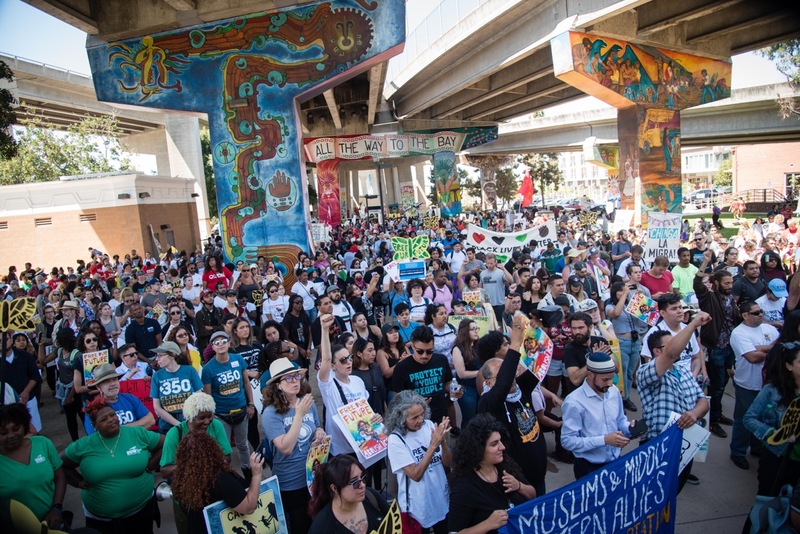 Thousands gather in Chicano Park in San Diego on July 2nd for the #FreeOurFuture rally and march organized by Mijente, The Majority, and others. Hand in Hand’s caravan to the border was neither the beginning nor end of their its action to reunite families--and to end mass criminalization of immigrant communities altogether. After Trump was elected, Hand in Hand launched a “Sanctuary Homes” campaign. Already accustomed to encouraging and equipping employers to talk with their workers about wages and working conditions, Hand in Hand asked members to have one-on-one conversations with their workers about how best to support them in the face of escalating attacks on immigrant communities. Gaining confidence, they then asked members to consider opening their homes to refugees. 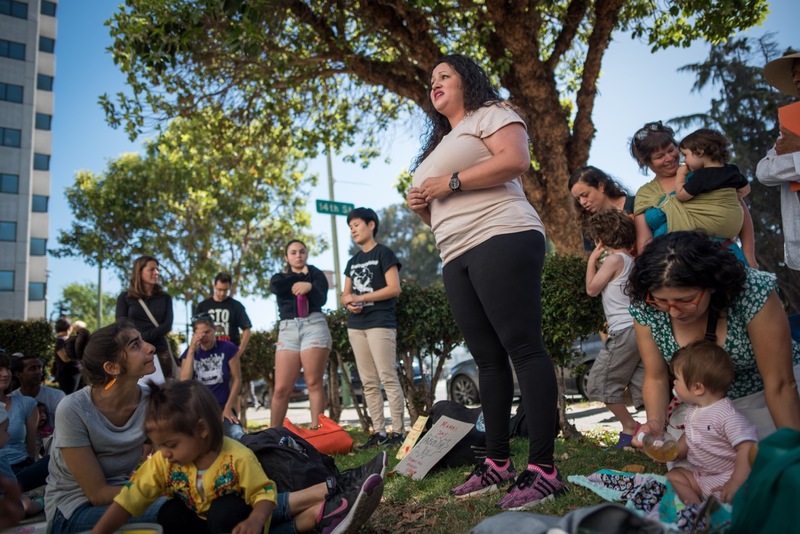 As the Sanctuary Homes campaign says, “The home can be a powerful center of moral action.” But Hand in Hand has also been taking it to the streets. Mothers and babies occupied a New York City ICE office in late June. Breastfeeding moms organized a “nurse-in” outside a New Jersey ICE office a few days later. Similar actions took place in Chicago and Detroit. Soon, activists from these actions started getting together on weekly phone calls to debrief actions and coordinate strategy. 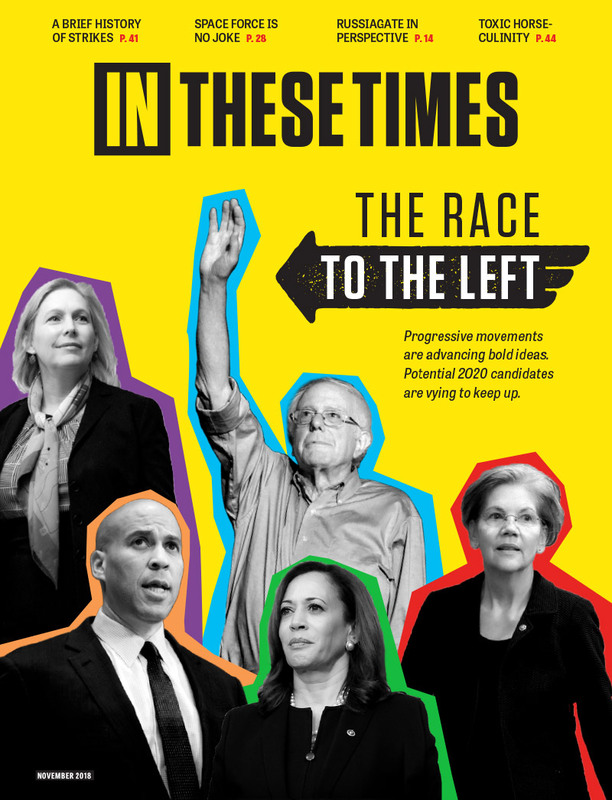 Following these successful actions across the country, the network produced a handy toolkit for first time or newer activists to organize their own family-friendly action—with tips on everything from how to locate the nearest ICE office and turn people out to how to get media attention and what to do if and when police arrive. Based on that template, at a recent “Playdate protest” organized by Hand in Hand in Oakland, approximately 100 young children and their parents met up at the local children’s library and marched across the street to the Alameda County Sheriff’s office to demand the official stop collaborating with ICE. As uniformed officers blocked the elevators to the building, children ranging from 4 months to 10 years old drew butterflies, a symbol of the right to migrate. They sang songs and spoke about every child’s right to be free. While most protests have focused on Trump’s policy at the national level, local actions that integrate local demands are proving surprisingly effective. Just this week, the Sheriff’s Office in Contra Costa County, California announced that it will cancel its multi-million dollar contract with the federal government to detain undocumented immigrants, citing among other things the costs and mounting public pressure of protests. Sacramento and Monterey Counties in California also recently terminated their contracts with ICE. For local immigrant families targeted by Trump, the trauma is real and long-lasting, as is the critical importance of building broad, intersectional movements that include employers of immigrant workers. “These family separations need to stop. It’s not just happening at the border, it’s happening in our own communities. It’s good to see employers, like Hand in Hand, here supporting immigrant families,” said Barraza. Many are doubtful that the Trump administration will make the rapidly approaching July 26th court-imposed deadline to reunite more than 2,000 children and their families, but to activists working around the clock to free immigrant families, one thing is clear: “We need to keep the pressure on,” says Kono. Lourdes Barraza, whose husband Fernando was detained by ICE last year, speaks out at a “Playdate Protest” organized by Hand In Hand and other organizations in Oakland, California on July 10.